I met an interesting man today — a man who probably changed a few lives without even really knowing it. He created a tool, a tool that my students have used in the classroom several times now — a tool that we’ll continue to use to help our students take charge of their environment and create the reality that they encounter every day. This whole experience started several months ago, when the lead teacher at our site texted me and my teaching partner, telling us of this fascinating material called Gridbeam. The material itself is simply wood, but it’s the manner in which the wood is used that makes it so remarkable. Each piece of wood is 1 1/2″ by 1 1/2″, with little holes lining each long side of the pieces of wood. 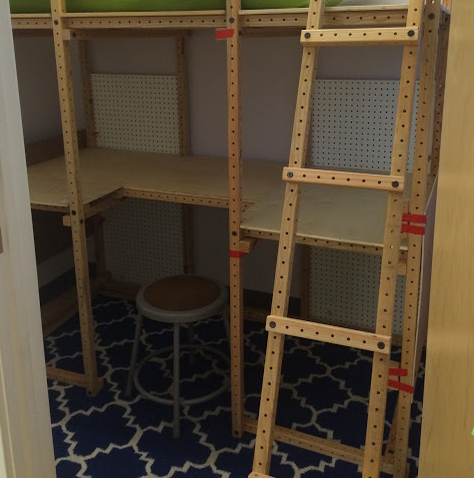 In each of these holes, children can push through screws and fasten them with an alan wrench, allowing them to piece together various sizes of wood to create virtually anything they’d want in the classroom. “It will totally add a student-driven component to your design project, Paul,” my site lead said to me. In the fall, the students built simple things like desks, small cabinets, and even a puppet show theater so they could perform for their peers. And now, as winter awakens into spring, they’re building chairs and lofts to help make our classroom even more unique — to make it into a place they truly feel is theirs. “You know, people always try to predict the future,” this interesting man told us, describing how in the 1960s, people imagined flying cars and robot maids, only to be disappointed when none of these things actually happened. And I began to think: I thought about what we’re trying to do at my school, and what we’re trying to do with education as a whole. I thought about how we’re trying to make learning interactive and meaningful, and about how we’re trying to change the landscape of the classroom into one where interests drive instruction and interactive lessons help kids to see the relevance in everyday academic tasks. I even thought about the person who once told me the classroom was “not the forum for changing the world,” implying that change would simply happen if we sat back and watched. But that’s not how change happens; that’s not how meaningful progress is made. Student-created desks — from cardboard iteration to the real deal! And with this interesting man’s clever anecdote, he sent a powerful and inspiring message, not only to me, but to all of the children that had the privilege of listening to his story today — the story that he began writing almost 40 years ago with his innovative building materials. You can spend time predicting the future — or you can spend time designing it. And last but not least… our new loft!